Presbyopia | conditions and cures for this eye problem. 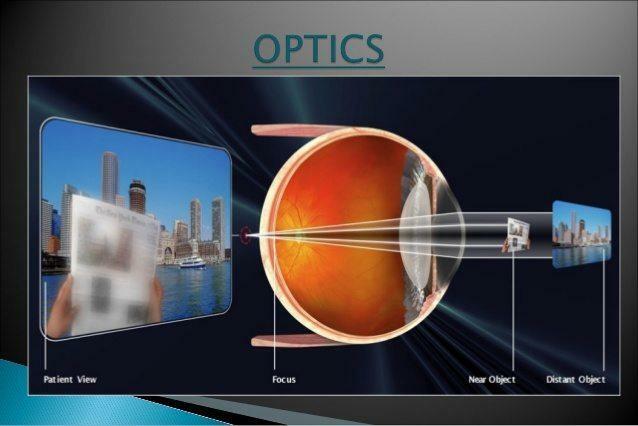 Presbyopia is an eye condition in which your eye slowly loses the ability to focus quickly on objects that are close. It’s a disorder that affects everyone during the natural aging process. When light enters your eye, it passes through your cornea. Then, it passes through your pupil. Your iris is the colored ring in your eye that opens and closes your pupil to adjust the amount of light passing through it. After passing through your pupil, the light passes through your lens. In its healthiest state, your lens changes shape so it can bend the light rays further and focus them on your retina at the back of your eye. However, your lens becomes less flexible with age. Then, it can’t change shape as easily. As a result, it’s unable to bend the light properly to focus it on your retina. The most common symptoms of presbyopia occur around age 40 for most people. The symptoms of presbyopia typically involve a gradual deterioration in your ability to read or do work up close. Hyperopia, or farsightedness, is a condition that has symptoms similar to presbyopia. However, they’re two different disorders. In both conditions, distant objects are clear but closer objects appear blurred. Hyperopia occurs when your eye is shorter than normal or your cornea is too flat. With these malformations, the light rays focus behind your retina, as in presbyopia. However, hyperopia is a refractive error that’s present at birth. It’s possible to have hyperopia and then develop presbyopia with age. When you’re young, the lens in your eye is flexible and relatively elastic. It can change its length or shape with the help of a ring of tiny muscles that surround it. The muscles that surround your eye can easily reshape and adjust your lens to accommodate both close and distant images. With age, your lens and the muscle fibers surrounding your lens slowly lose flexibility and stiffen. As a result, your lens becomes unable to change shape and constricts to focus on close images. With this hardening of your lens, your eye gradually loses its ability to focus light directly onto your retina. The most significant risk factor for presbyopia is age. Most people lose some ability to focus on close objects by age 40. It affects everyone, but some people notice it more than others. Certain diseases or drugs can cause presbyopia in people younger than age 40. When the symptoms of presbyopia occur earlier than usual, it’s called premature presbyopia. If you notice the symptoms of presbyopia at an age earlier than normal onset, it may be a sign of an underlying medical condition. having decompression sickness, or “the bends,” which results from rapid decompression and typically occurs in scuba divers that surface too quickly. Contact your doctor or eye specialist if you have any of the symptoms of presbyopia. Even if you’re not experiencing symptoms, you should have an eye examination by age 40. According to the Foundation of the American Academy of Ophthalmology, adults who don’t have any symptoms or risk factors associated with eye disease should have a baseline examination at age 40. An eye screening can identify early signs of disease and vision changes that can begin, sometimes without any symptoms, around this age. Presbyopia can be diagnosed as part of a comprehensive eye examination. A typical exam will include tests to evaluate your eyes for the presence of diseases and vision disorders. Your pupils will probably be dilated with special eye drops to allow your doctor to examine the inside of your eye. No cure exists for presbyopia. However, there are several treatments available to correct your vision. Depending on your condition and lifestyle, you may be able to choose from corrective lenses, contact lenses, or surgery to correct your vision. If you didn’t need eyeglasses before getting presbyopia, you might be able to use nonprescription reading glasses. These readers are typically available at retail stores, such as drug stores. They typically work best for reading or close work. When selecting a pair of nonprescription reading glasses, try different degrees of magnification. Choose the lowest magnification that allows you to read a newspaper comfortably. Prescription reading glasses can be prescribed if you have no eye problems other than presbyopia and prefer not to purchase your glasses off the shelf. Bifocals have two different types of focus, with a noticeable line between them. The upper portion is set for distance while the lower portion is set for reading or close work. Progressive lenses are similar to bifocal lenses. However, they don’t have a visible line, and they offer a more gradual transition between the distant and close portions of the prescription. Trifocals have three different points of focus. The portions are set for close work, mid-range, and distance vision, and they can be made with or without visible lines. Bifocal contact lenses provide the same option as bifocal glasses. Monovision contact lenses require you to wear a contact lens set for distance vision in one eye and a different contact lens set for close work in your other eye. Modified monovision contact lenses require you to wear a bifocal contact lens in one eye and a contact lens for distance in your other eye. Both eyes are used for distance, but only one eye is used for reading, and your brain adjusts as needed to process the image. Your eyes will continue to gradually lose their ability to focus on close objects as you age. As a result, your prescription will have to be reviewed and changed according to the advice of your eye specialist. Conductive keratoplasty (CK) involves using radiofrequency energy to change the curvature of your cornea. While it’s effective, the correction may diminish over time for some people. Laser-assisted in-situ keratomileusis (LASIK) can be used to create monovision. This adjustment corrects one eye for near vision and the other eye for distance. Refractive lens exchange involves the removal of your natural lens. It’s replaced with a synthetic lens, called an intramuscular lens implant, inside your eye. If your presbyopia is undiagnosed or uncorrected, your vision will likely deteriorate gradually. It will increasingly affect your lifestyle over time. You may experience a significant visual disability if a correction isn’t made. You’ll develop problems maintaining your usual levels of activity and productivity at work and in everyday activities. When tasks such as reading small print become difficult and remain untreated, you’re at risk of headaches and eyestrain. It’s also possible to have a different type of eye problem in each eye. In most cases, the vision you’ve lost to presbyopia can be corrected with eyeglasses, contact lenses, or surgery. The gradual decline of the elasticity required to focus your lens on near objects continues until about age 65, which is when most of the elasticity is gone. However, even at that point, correction to see close objects is possible. Talk to a Vision Market Place Lasik Eye Center eye specialist about any changes in your vision or eye health. Many eye diseases and conditions can benefit from early intervention and treatment.